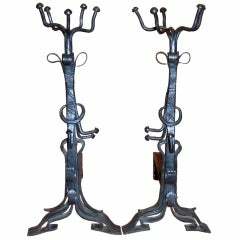 An impressive pair of andirons expertly forged from railroad track steel. 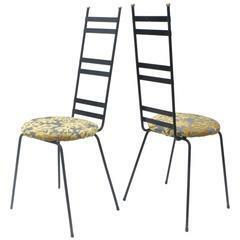 The slightly modernist and slightly folk arty set will add drama and eye-catching scale to your hearth. Clean and strong with no breaks. Hand refinished recently and rubbed with several coats of oil. A pair of impressive andirons with knock handles. Nickeled wrought iron-very heavy. 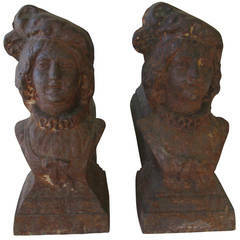 Small matched pair of Goddess andirons. 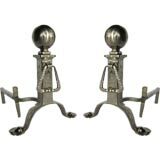 Satin brass, brass or nickel pair of large andirons with Chippendale ball and claw feet. Please see our large selection of Andirons and fire place tools or accessories.